A Rare, Exclusive Paddling Adventure in the Canadian Arctic! Chances are, you’ve never heard of the Thomsen River. Or Banks Island, which this flat, silver ribbon of water ambles across on its way to the Beaufort Sea. That’s because hardly anyone ever travels here. 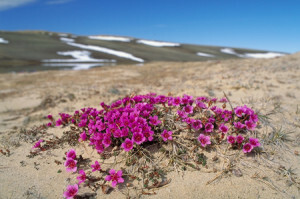 Way up at the top of Canada’s Northwest Territories, you’ll find some of planet’s most impressive Arctic wilderness. 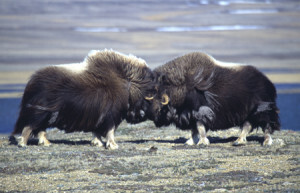 Not to mention nearly 70,000 shaggy musk oxen that call this High Arctic island home. Paddling the Thomsen River. Photo: Wayne Lynch, Parks Canada. Explorers’ Corner is the only adventure travel outfitter licensed to run kayak trips on the Thomsen! No special skills are needed to paddle this gently flowing river — one of the most northerly in the world — across the treeless expanse of Aulavik National Park. Our relaxed schedule and the perpetual daylight allow us plenty of time for hiking through meadows of blooming flowers, exploring the rolling hills and broad vistas, and observing permafrost features, archeological sites and prolific wildlife — not least the magnificent musk ox! Anglers can fish for arctic char along the way, to grill over an open fire as we set camp on the riverbank each evening. Be among the handful of adventurers who discover the Arctic wonders of Aulavik National Park, as you paddle the Thomsen River on Banks Island with us this summer!